Worried about the ingredients in your food? If you make it yourself you know exactly what's in it and you save money. 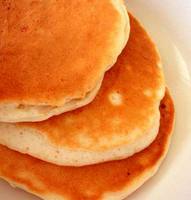 I make my own baking mix (Bisquick), so easy and the pancakes turn out really yummy, and it's not just for pancakes, use this anywhere you would have used Bisquick, rolls, dumplings, desserts. Mix dry ingredients, cut in shortening by hand or use a food processor if you have one (I just pulse it a few times in my food processor). Store in an airtight container, I usually make one batch at a time but it can be done ahead of time. The great thing is you know exactly what ingredients are in it, and you know it's fresh and hasn't been sitting in a box for months and months. I usually make a large batch (more than what we need for that meal), I make it all into pancakes then I put them in a ziploc bag and keep them in the freezer. For breakfast in the mornings before school, I pull 2 pancakes out for my daughter, so much cheaper than buying the pre-packaged pancakes or french toast.